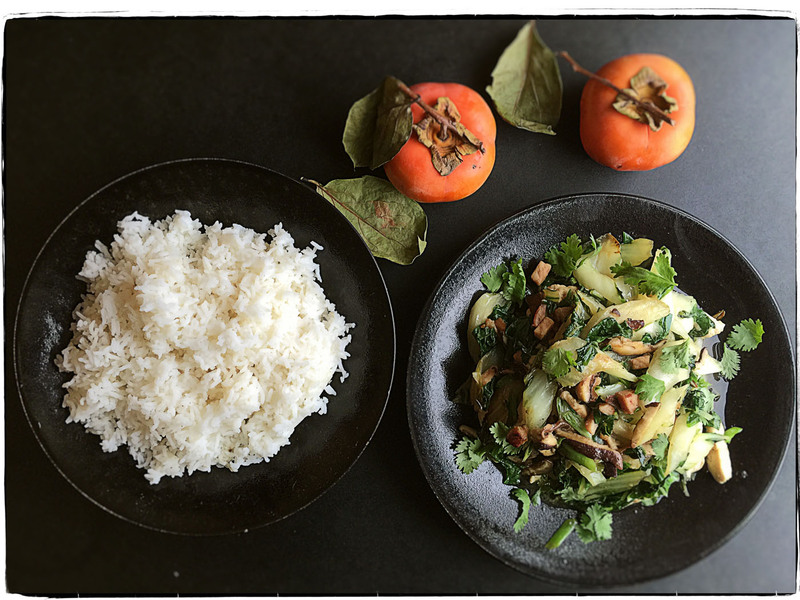 On our morning forage, our little supermarket offered up a good looking bunch of bok choy and some shiitakes, so it was a stir-fry for lunch today. We sliced a half chicken breast, half a smoked pork chop, some scallions, the stems and leaves of the bok choy, and the mushrooms. We made a pot of rice and stir-fried everything, adding a drizzle of sesame oil and a splash of Shaoxing wine at the end. We scattered fresh cilantro leaves on top and pulled out the old chopsticks. The persimmons are too beautiful to eat, so we feast on them with our orbs.